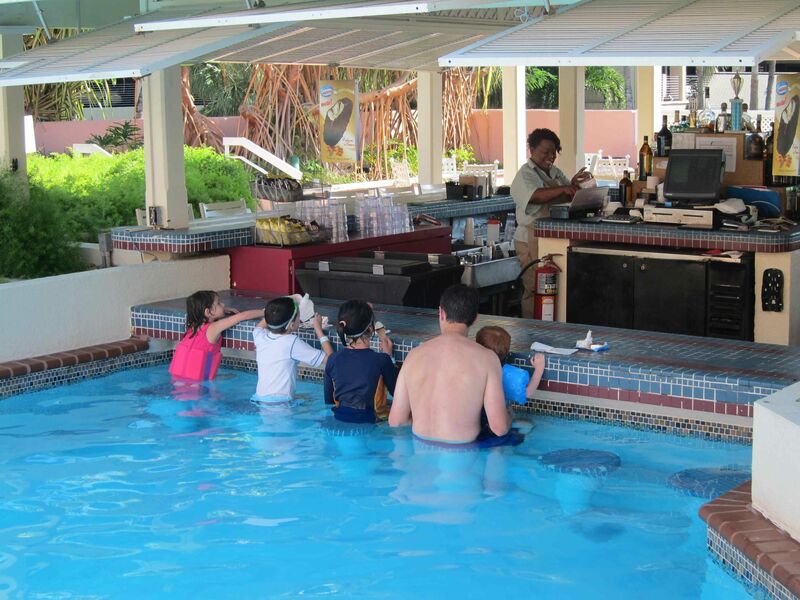 The swim-up bar at Comfort Inn & Suites is very popular. Comfort Suites has its own pool for guests. Watching marinelife float by at Atlantis Resort. 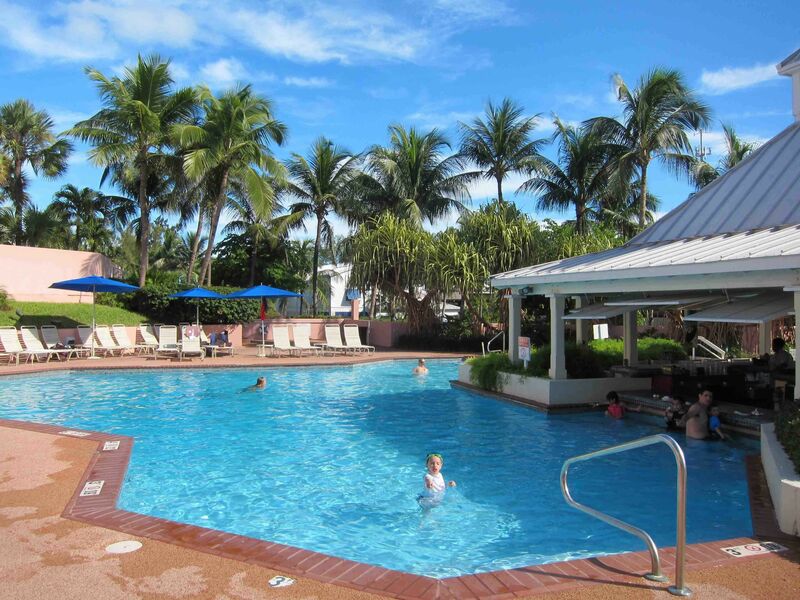 I am delighted to recommend the Comfort Suites Paradise Island hotel, a wallet-conscious way for the family to enjoy an Atlantis family beach vacation without breaking the bank. My kids had been aching to visit Paradise Island in the Bahamas — especially Atlantis, undoubtedly a great family resort — but we knew this family vacation would not come cheap. Sure, we might have scored a low-season discounted room rate, which includes unlimited access to such Atlantis thrills as the famed waterparks. Its endless waterscape, dolphin encounters, aquariums brimming with tropical fish, phenomenal kids club and stunning beaches are the stuff of tween dreams. And though I know that children have a fabulous time splashing around on a never-ending variety of water rides (with something to suit daredevils and scaredy-cats alike), I found that nearly everything else at Atlantis costs extra, from Wi-Fi to a cup of coffee. Those add-ons would have been a bitter end to a sweet vacation. So we called the Comfort Suites home. The Comfort Suites Paradise Island is located across the street from Atlantis, which is so sprawling that our room was actually closer to the resort action than some rooms at Atlantis proper. Guests of the Comfort Suites are allowed full, complimentary use of all Atlantis facilities. The non-stop water experience is included in your modest room rate. The water slides, wave pool, mile-long river ride with high intensity rapids, 13 pools and more are all yours, all day. This is a noteworthy value, as a day pass for Atlantis usually costs over $100 per adult, with a slight discount for kids. You are given a pink card at check-in and you must present this daily at Atlantis to receive wristbands that allow you round-the clock fun at the mega-resort. As Atlantis is cash-free, you may charge food, drink and sundries back to your Comfort Suites bill. The Comfort Suites is a mid-sized, three-story hotel whose 224 rooms were fully renovated in the spring of 2014. With new bedding, sofa beds for the kids, fresh furnishings and fabrics, the granite countertops in the bathrooms are just another nice touch. What families appreciate is that the rooms are all spacious junior suites, with either two double beds or a king bed. Every room has a semi-partitioned area with a desk and that new sofa bed, for a touch of privacy. All rooms now offer flat screen TV, refrigerator, in-room coffee and tea service. Microwaves are available free of charge, as are cribs. Our room was not fancy, just very clean and comfortable, with a great view of the landscaped pool area. Wi-Fi worked consistently and was blissfully free of charge, another reason why the Comfort Suites Paradise Island has won a TripAdvisor Certificate of Excellence for the past three years. The room rates at Comfort Suites vary according to season, with low season rates starting at $150 nightly. In accordance with local ordinance, only four guests are allowed per room, though you could easily squeeze in a few more. Budget savvy travelers should be on the lookout for frequent deals and specials. One major money-saver was the free American breakfast buffet served each morning from 7am-10am. It featured several hot entrees, such as scrambled eggs, waffles and bacon, plus cereal, fresh fruit, juice and baked goods. It will not be mistaken for haute cuisine, but it is a good way to fill up hungry kids for a day of active adventures. With hotels in the area charging up to a whopping $30 per person for the morning meal, you don’t need to be a math geek to calculate the savings. We ate our breakfast at the poolside tables, under shady tropical flora, giving our day a “scrambled eggs in Paradise” start. During our autumn visit, one special had kids under 12 lunching free with a paying adult at the Comfort Suites restaurant. Though the food is not going to win any culinary awards, it was fresh and filling. Kids eat dinner for free as well at a choice of several tasty neighboring eateries. Another “Instant Savings” deal offered a discount of $250 on a four-night stay. This translates into legitimate savings and makes Comfort Suites one of the top family values in the Bahamas, if not in the entire West Indies. 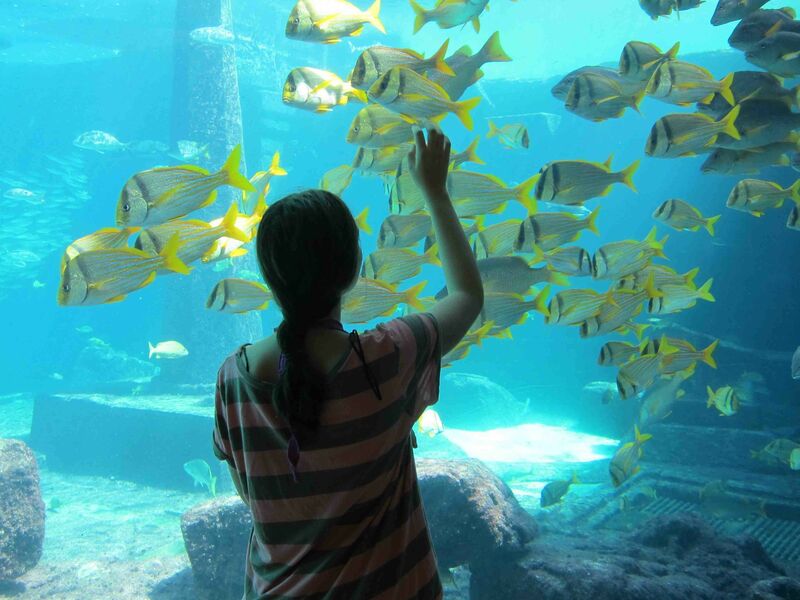 Of course, you will have to pay for extras such as the Atlantis Kids Adventures supervised kids club, and the nearby Dolphin encounter, but so do guests of Atlantis. The swimming pool was my favorite part of the Comfort Suites. This may sound surprising, as Atlantis is famous for their scores of pools, slides and fountains. But at the Comfort Suites, the little-used pool was quiet and calm for much of the day. It was a tranquil oasis, where we swam under the watchful eye of a lifeguard, sunned and indulged in mocktails and cocktails at the small swim-up bar. The bartender, Christal, has been with the hotel for 22 years and was a one-woman welcoming committee, setting the friendly poolside vibe. The pool saw more action in the late afternoon, when many families returned from Atlantis in time for one more swim, but it never had the frenetic feel of Atlantis. Another reason I liked staying at the Comfort Suites is that it is a non-smoking property. Atlantis limits smoking, but the casino is clouded with a heavy veil of smoke. Speaking of casinos, I personally dislike staying at properties that house them, one more plus for the casino-free Comfort Suites. If you are planning a tropical getaway with the grandparents, Comfort Suites is well worth considering. I saw several multi-generational groups staying at the Comfort Suites. Grandparents stayed behind with the babies, while the parents headed to Atlantis with the bigger kids. Large family groups especially benefit from the intimate nature of the Comfort Suites. After a few days, employees knew us and everyone was genuine and helpful. I liked the easy, classic layout of the property. At Atlantis, I never could figure out where everything was and was constantly asking for directions. Comfort Suites is a typical motel-like structure, so it was easy to find our room, the lobby, the pool and the breakfast room. As I lounged by the pool, I caught myself thinking that even if I could afford the rates at Atlantis, might I choose the more human dimensions of Comfort Suites? While few would stay at the Comfort Inn and never venture over to Atlantis, there are many good reasons to visit including a variety of eateries on the Atlantis property. Numerous casual shacks serve simple burgers, salads and sandwiches, and you are expected to eat in your swimsuit. These are a convenient lunch option if you don’t want to stray far from the lagoon pool or lazy river ride. There are more pricy eateries that are fine dining options. We had a very good meal at Virgil’s, for example, an authentic barbeque restaurant that’s an offshoot of a famous New York City place. We also enjoyed eating and people watching at Marina Village, Atlantis’ shopping center located next door to the Comfort Suites. Moderately priced eateries were a mix of the familiar, such as Starbucks, Jamba Juice and Johnny Rockets, as well as a delicious Bahamian favorite, Bimini Road. Our proximity to Marina Village gave us the chance to soak up a smattering of local color on Saturday night, when a weekly parade adds a festive flair. Musical instruments are available for kids to handle, with locals and tourists swaying to the beat. If you want to get a dose of retail therapy with authentic flavor, head to the Straw Market in Nassau, a few minutes’ taxi ride from the hotel. You are expected to negotiate the price for handmade Bahamian crafts at this lively outdoor artisan market. There are non-stop flights from numerous U.S. cities to Nassau. Our JetBlue flight from New York City took just over two hours. We were at the Comfort Suites 30 minutes after we cleared customs, so our journey to the sun was painless. 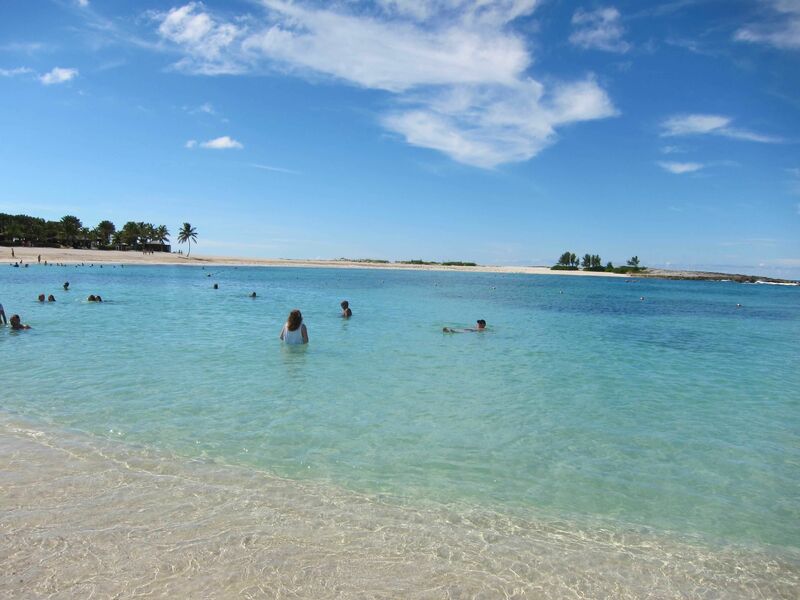 For more information on planning a trip to Paradise Island, visit GoParadiseIsland.com.